Here is the result of a day of wallpaper removal. 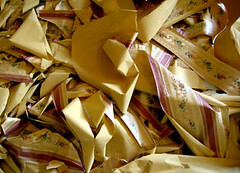 Somehow the heap of removed paper was more interesting in this form than gracing the walls. I understand that centuries ago wallpaper was used as art and to mimick the look of luxurious fabrics. Personally, I can’t wait til it is all removed from our rehab house. Let’s see… bedroom #2 and #3 completed. That just leaves bedroom #1, the foyer, a hall, the living room, dining room and one bathroom! YIKES! Apparently the wallpaper in bedroom #3 was a single ply paper that came of easily. Different situation in bedroom #2! This shiny embossed paper is two ply! I found that I could scrape off the first layer easily, but under neath I found a thick backing that required a repeat of the entire process. Ole well… it got done! And as it came off I uncovered the lively avocado green that was original to this 60’s rancher. I kind of like it! The Wallpaper has to Go! 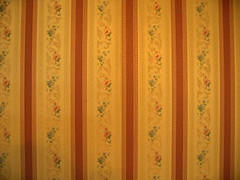 This is a close up of the “lovely” wallpaper in bedroom #2. 1. Use the special wallpaper scoring tool. This tool is rubbed over the wallpaper to make tiny perforations in it that will allow the liquid goop to seep under the wallpaper and loosen it. 2. Roll on, sponge on, or spray on the removal goop. 3. Wait a few minutes. 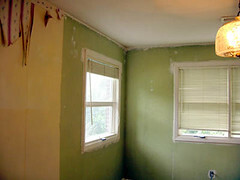 This process worked well for me on bedroom #3, so now I will see how it does in this room. Wish me luck! OK. Today is wallpaper removal day! 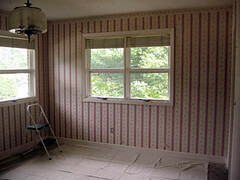 Here is the “before” shot of bedroom # 2 in our rehab house project. I am having flashbacks to the old Victorian house I grew up in on Olive Street. My amazing mother scraped wallpaper from 10′ walls in room after room, replacing the tired coverings with fresh peach paint in my bedroom. 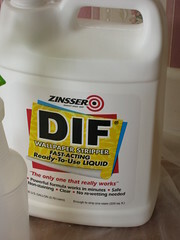 I remember the tall ladder she bravely mounted and the labor required to remove layer after layer of the hideous stuff. I am lucky. I beleive there is only one layer in this room with standard 8′ ceilings. Still… seems daunting… but here we go! You are currently browsing the archives for the wallpaper removal category.